Here’s something you probably know - finding the right talent for your company or organization is critical to its success. And something else you probably know - finding the right person to replace an important member of your team is getting harder and harder. But, do you know what it really costs for your company or organization to go out and fill those important roles? It may surprise you. It can cost as much as 213% of an employee’s salary to get a suitable replacement for an employee who leaves. For executives, that can easily reach into many hundreds of thousands of dollars. Those costs include the simple things to calculate, like the cost of job posting ads or hiring a search firm, but they also include things that don’t immediately come to mind, like the additional costs of onboarding a new employee or the lower productivity that a new employee will have as they begin working and gain the institutional knowledge critical for high performance. Here’s what you should think about when finding new employees and how you might be able to reduce some of these costs through better training or institutional processes a new hire can pick up quickly. Some larger companies have the ability to post on their own websites and receive a flood of applications for every open position without having to pay for outside advertising, and some companies have a strong enough reputation and deep relationships in an industry that they can fill positions without needing to advertise. For most companies, however, job posting will need to go up on third party sites, like Indeed.com, Monster.com, various local job posting boards (like AllYouCanTech in our home state of Vermont), LinkedIn, industry-specific sites, college and university boards, newspapers, or other various speciality sites. There are thousands and thousands of places to post job postings and most require some fee to post. The price may range from a few dollars per ad to a few thousand dollars to promote the listing and get it in front of the right people. The next step up in terms of direct hiring costs are costs associated with using a recruiter or search firm. More often used for executive searches, using a recruiter can be a way to get more qualified applicants for a role that are beyond the company’s typical reach. Recruiters and search firms are expensive. Some recruiters charge a flat fee for finding a candidate. This may be anywhere from a few thousand dollars to more than $300,000 depending on the level of employee you are looking to replace. More commonly, recruiters charge a contingency fee and charge between 20% and 33% of the employee’s first-year salary. Many companies find it worth the cost to use a search firm because it often results in more qualified applicants and cuts down on the time needed to do screening interviews early in the hiring process. Since the turnaround from the 2008 recession began, the average time it takes to fill positions has been steadily climbing, and across all industries. In early 2009, it took on average less than two weeks to fill a job. Today it takes closer to a month to fill a vacancy, and in April 2017, the mean vacancy duration was the highest in history at 30.0 days. Smaller companies generally hire more quickly than larger companies, and their mean vacancy duration is less than a month. Very large companies, those with more than 5000 employees, however, have much longer vacancy durations. On average, very large companies take more than two months to fill a vacancy. This slide from the DHI group shows how these vacany times have increased in recent years. Almost every industry has seen an increase in the time it takes to hire over the past few years but some have it worse than others. Some of this is absolutely good news, though. It means that the labor market is stronger and there are not a large number of unemployed folks applying to every job opening. For employers, on the other hand, the current situation means it’s harder to find the right fit for an open position. The longer it takes to find the right talent the more money is spent and more productivity is lost while a position stays unfilled. Large companies can often weather unfilled positions more than smaller companies, which helps explain why positions remain unfilled longer. The sense of urgency is not there. For very small companies, unfilled positions can be debilitating. After spending all sorts of time and money advertising, interviewing, negotiating, and finally hiring a new employee, the costs of turnover don’t just stop. The new employee needs to be onboarded and receive training to get up to speed in their new role. Training takes time and it also takes money. According to Josh Bersin of Deloitte, companies typically spend 10-20% of an employee’s salary on training over a 2-3 year period. For entry level roles a new employee may need to be trained to do much of their job. For other roles, training is more about the institutional processes and tools that a company uses. Take, for example, a new marketing manager joining your company. That person has been working at other companies and using various tools and processes that may be very different from those at your company. It may not be as simple as learning one new tool to get up to speed, it may be learning 10-12 new tools. 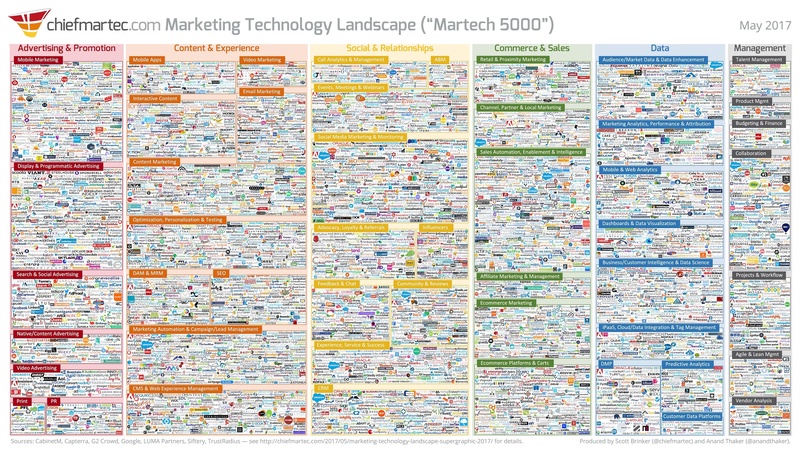 Take a look at this supergraphic from ChiefMartec.com about the marketing technology landscape. There are thousands of tools (5,381 to be exact as of May 2017) and new ones being created almost every day. The sheer number of options brings up another important issue to consider. When choosing what tools your company will use, it’s important to think about ease of use and easy integrations with other tools. If you can reduce the time needed to train a new employee because the tools at your company are intuitive, you’ll save a lot in training costs and the time needed to have that employee work at a high level. One of the most often overlooked area when it comes to calculating the cost of employee turnover is the lowered productivity that a new employee has in their new role. It may take as long as 2 years for a new employee to contribute at the same level as a previous employee. Some of this lower productivity comes from the onboarding and training needed for a new employee. Spending time as a company to make sure onboarding and training are as effective as possible can help to ramp up a new employee’s productivity. And with that is choosing the right tools and internal processes that an employee can pick up quickly. One thing we see a lot in our work with companies trying a digital asset management system for the first time is that there is often a lot of individual control of digital assets. That means that one person might know where a particular asset is and others do not. If that person with knowledge leaves the company, that problem can be exacerbated. At Image Relay, we work with companies to build organizational structures and taxonomies for their digital assets so not only does the team and relevant partners know where to find what they need, but new employees can be onboarded and quickly trained to know where to find the things they need to be successful. Lower productivity or new employees does not just come from training, tools, and process concerns, though. There are important cultural issues to consider as well. New employees often feel confused and overwhelmed. If they are not welcomed and made to feel “part of the team” these feelings can grow. If you truly view your organization as being a team, it’s important to consider how you welcome new members to that team. I don’t mean for this post to be discouraging, but I wanted to highlight some of the large and sometimes overlooked costs of employee turnover. When it comes to your company, some things are harder to control, like how many people will reply to a job posting. There are other things, however, that you can do to help lower the costs and pain of turnover, like choosing tools and developing processes that work for your team and new team members. The most important area you control with regard to turnover, and the one that can help reduce the number of people wanting to leave your company as well as improve the ability for new employees to join, is your culture. Does you company have shared values (this does not mean everyone has to be homogenous, so perhaps chemistry is a better term)? What are they? Are employees encouraged to seek out and allowed to partake in learning opportunities? Are employees rewarded for their work and feel the appreciation your organization has for all they do (and yes, that means compensation, not just high fives)? Does the company have values that extends beyond just the products they make, like embracing the environment or local communities? There’s no ideal culture that will work for every company or organization but not focusing on and feeding your company culture can lead to trouble. For us at Image Relay we took the step to become a certified B-Corp as part of our commitment to our values and culture. Becoming a B-Corp is one way to go, and although it may not be the right move for everyone, being serious about culture should be a top priority for everyone.